Three days after my cats arrived at our new home, Amy (the outdoorsy one) got too adventurous in her exploration of the new neighborhood and went missing. At first I wasn’t too worried — she had wandered off before at previous places we’d lived at, but always returned within four days. So after a week had gone by and there was still no sign of her, I became concerned. I wandered up and down the hills of my neighborhood, calling for her. I printed out flyers and put them on my neighbor’s doorsteps, asked anyone I met along the way if they’d seen her. I called up the microchip-tracking service to report her missing, and filed a missing pet report with the local Humane Society. After seven weeks, I decided to make a last-ditch effort to find Amy. I knew if I were able to show a photo of her to the vast majority of residents in my neighborhood, someone was bound to recognize her (assuming she was still alive). However, my previous canvassing of the neighborhood had proved difficult, due to the hilly terrain and steep driveways in my neighborhood. Distributing flyers to just a dozen houses left me exhausted. So decided to enlist the help of the U.S. Postal Service. I went online and ordered postcards from a direct-mail service with Amy’s photo and my phone number printed on each. I then had the postcards sent to all addresses within a one-mile radius of my house. 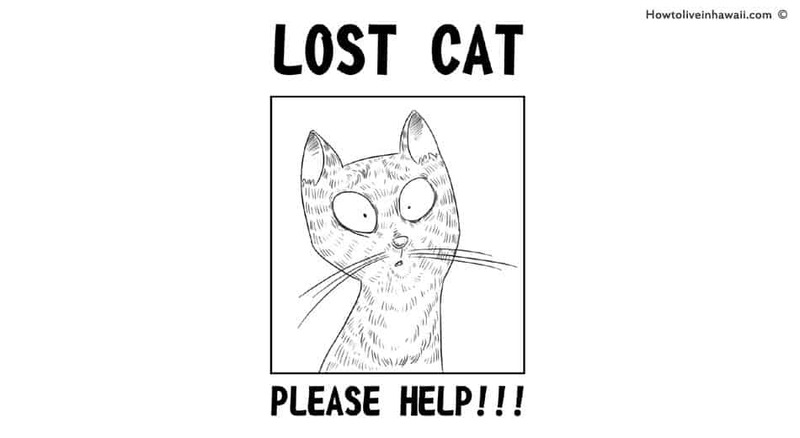 About a week later, my “Lost Cat” postcards began arriving in my neighbor’s mailboxes. Or at least that’s when I started getting phone calls, many from people who had not seen Amy, but wanted to express their sympathy. After four days of well-intentioned but ultimately fruitless phone calls, I got a voicemail from a woman named Bonnie, who said that a cat that looked just like the one the postcard had been hanging around her backyard every evening for the past month. When I called her back, I discovered she lived only a quarter of a mile away from me. As harrowing as the experience was, it did prove to be a good way to meet my neighbors. Bonnie and I still keep in touch — in fact, I recently helped her with a fundraiser at her son’s school. I count myself fortunate to not only have found my cat, but also a new friend.